True Organics -- VitaGloVitaGlo.com has Thousands of Vitamins, Diet, Sports Supplement products online! If it doesn't have the seal, it's not real. 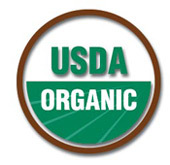 Having the USDA organic seal on the package means 95% or more of our product has been organically produced according to the strictest standards - no pesticides or harmful chemicals, no worries for you or your family. Choose from our extensive line of organic products for better health, pure and simple.